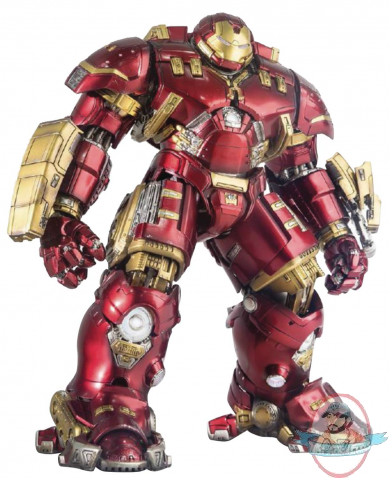 From Comicave Toys.The main suit featured in Marvel's Avengers: Age of Ultron, the Hulkbuster armor can be deployed from orbit, forming a protective shell around the Mark 43. The 1/12 Scale Hulkbuster is a 75% die-cast metal, fully articulated figurine with articulated systems and mechanisms throughout its suit! At approximately 11 inches tall, the armor features over 60 points of articulation, and LED lights in various parts of the suit, including eyes, chest Arc Reactor, palms, back, knees, calves, and soles. A spring-loaded mechanical chest reveals the Iron Man Mark 43 base armor which features its own LED lighted eyes and chest Arc Reactor. Extendable joints throughout the figure enable extensive posability and playability.